251 Beacon is located on the south side of Beacon, between Clarendon and Dartmouth, with 249 Beacon to the east and 255 Beacon to the west. 251 Beacon was built ca. 1868 for real estate dealer Henry Whitwell, for speculative sale, one of six contiguous houses (241-243-245-247-249-251 Beacon), designed as three matching and symmetrical pairs. 239 Beacon was built at the same time and in the same style; 253 Beacon (since destroyed) also was built at the same time and probably in the same style. Click here for an index to the deeds for 251 Beacon. On March 4, 1869, 251 Beacon was purchased from Henry Whitwell by Augustus (Edward Augustus Holyoke) Hemenway, a shipping merchant in the South American trade and owner mines in Valpariaso, Chile. He and his wife, Mary (Tileston) Hemenway, lived at 40 Mt. Vernon and in Milton. By 1872, 251 Beacon was the home of retired merchant Shirley Erving and his wife, Abby Sophia (Briggs) Erving. They previously had lived in Roxbury. Shirley Erving died in February of 1873. Abby Erving continued to live at 251 Beacon in 1874. In 1875, it was the home of Mrs. John Child, a widow. By 1876, she had moved to 164 Salem, and 251 Beacon was once again the home of Mrs. Erving. She continued to live there until about 1880. Although she continued to be listed in the City Directories through 1880, Mrs. Erving was no longer listed at 251 Beacon in the 1879 and 1880 Blue Books. Instead, Mr. E. H. Allen was listed there in 1879 and Mr. J. S. Fay in 1880. The 1880 entry for J. S. Fay probably was for Joseph Story Fay, Jr., an iron merchant, and his wife, Rebecca Rodman (Motley) Fay. In 1880, they were in the process of building a new home at 169 Commonwealth, to which they moved in 1881 (they were living at 88 Mt. Vernon with his parents, Joseph and Sarah (Bryant) Fay, in October of 1880, when their son, Alan Motley Fay was born, but were not enumerated there in June of 1880 at the time of the 1880 US Census). 251 Beacon was not listed in the 1881 Blue Book, and by 1882 Abby Erving had made Newport her home. Augustus Hemenway had died in June of 1876, while on a trip to Cuba. 251 Beacon remained the property of his estate. By the 1881-1882 winter season, 251 Beacon was the home of attorney Francis Peabody and his wife, Rosamond (Lawrence) Peabody. They had married in January of 1881 and 251 Beacon probably was their first home together. In 1880, prior to their marriage, he had lived in Salem. Francis Peabody was known as “Francis Peabody, Jr.,” but was the son of Samuel Endicott Peabody and the grandson of Francis Peabody. The Peabodys continued to live at 251 Beacon during the 1882-1883 winter season, but moved soon thereafter to 230 Beacon. During the 1883-1884 winter season, 251 Beacon was the home of Dr. Thomas Dwight and his wife, Sarah C. (Iasigi) Dwight. They had married in September of 1883, and 251 Beacon probably was their first home together. Dr. Dwight was a physician and professor of anatomy at Harvard Medical School. By the 1884-1885 season, they had moved to 235 Beacon. By the 1884-1885 winter season, 251 Beacon was the home of Pierre Clarke Severance and his wife, Isabella Morgan (Rotch) Severance. They previously had lived at 12 Brimmer. He was an importer of and dealer in window glass. They continued to live there during the 1887-1888 season, but moved soon thereafter. By the 1887-1888 winter season, it was the home of Henry Bainbridge Chapin and his wife, Susan Torrey (Revere) Chapin. They had married in October of 1887 and 251 Beacon probably was their first home together. He was freight manager for the Boston & Albany Railroad and later would become an investment banker and broker. They continued to live at 251 Beacon during the 1890-1891 season, but moved soon thereafter to Jamaica Plain. Henry Chapin had leased 251 Beacon from Augustus Hemenway’s estate under a lease expiring on August 1, 1895. After moving to Jamaica Plain, he subleased the house to others. By the 1891-1892 winter season, 251 Beacon was the home of Harcourt Amory and his wife, Gertrude Lowndes (Chase) Amory. They had married in April of 1891 and 251 Beacon probably was their first home together. Prior to their marriage he had lived at 1 Commonwealth with his mother, Mary Copley (Greene) Amory, the widow of James Sullivan Amory. Harcourt Amory was a textile manufacturer, treasurer of the Indian Head Mills in Alabama and the Lancaster Mills. They continued to live at 251 Beacon during the 1893-1894 winter season, but moved soon thereafter to 293 Beacon. Mary (Tileston) Hemenway died in March of 1894, and on August 10, 1894, 251 Beacon was purchased from Augustus Hemenway’s estate by Miss Charlotte Henderson Guild. The sale was subject to the lease with Henry Chapin, which would expire on August 1, 1895. Charlotte Guild probably lived at 80 Beacon with her mother, Elizabeth Henderson (Rice) Guild, the widow of Samuel Eliot Guild. Elizabeth Guild died in June of 1894, and by 1875 Charlotte Guild was living at 77 Marlborough . During the 1894-1895 winter season, 251 Beacon was the home of Theophilus Parsons and his wife, Mary Mason (Oliver) Parsons. They had married in August of 1894, and 251 Beacon probably was their first home together. Prior to their marriage, he had lived at 398 Beacon. Theophilus Parsons was treasurer of Lyman Mills in Holyoke, manufacturers of cotton fabric. In February of 1895, he purchased and they subsequently moved to 223 Beacon. During the 1895-1896 winter season, 251 Beacon was the home of Edward Williams Atkinson and his wife, Ellen Forbes (Russell) Atkinson. They had married in November of 1894 and spent the 1894-1895 winter season in Europe. He was an importer of machinery and raw materials for textile mills. By 1897, they were living in Brookline. By the 1896-1897 winter season, Charlotte Guild had made 251 Beacon her home. She continued to live there until her death in May of 1920. 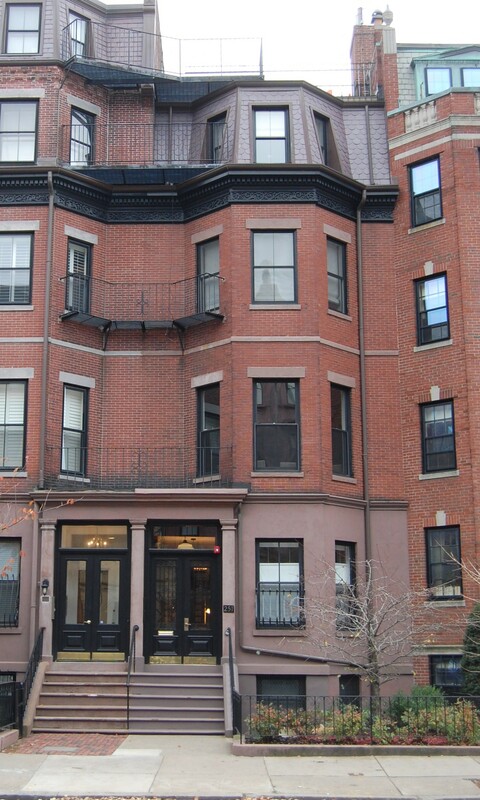 251 Beacon was inherited by Charlotte Guild’s brother, Samuel Eliot Guild. He and his wife, Jessie Rodman (Motley) Guild, lived at 102 Beacon. On February 17, 1922, he transferred 251 Beacon into his wife’s name. Jessie Rodman (Motley) Guild was the sister of Rebecca Rodman (Motley) Fay who probably lived at 251 Beacon with her husband, Joseph Story Fay, Jr., during the 1879-1880 winter season. By the 1920-1921 winter season, 251 Beacon was the home of William Watson Caswell and his wife, Pauline (Starr) Caswell. They previously had lived at 192 Beacon. William Caswell had been a manufacturer of ramie thread (used extensively in gas lighting mantles) and later served as treasurer of Arthur D. Little, Inc. They continued to live there in 1924, but moved thereafter, probably to New York City, where they were living in 1930. During the 1924-1925 winter season, 251 Beacon was the home of attorney Frederick William Eaton and his wife, Jennie S. (Smith) Newman Eaton. Their primary residence was in Concord. Living with them were Harding Carruth Newman and Dorothea Newman, Jennie Eaton’s children by her first marriage, to Albert Harding Newman. 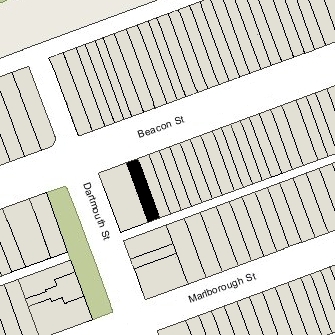 By the 1925-1926 season, they had moved to 166 Marlborough. In 1926, 251 Beacon was a dormitory for Katharine Gibbs School. 251 Beacon was not listed in the 1927 Blue Book. During the 1927-1928, winter season it was the home of Arthur Cecil Butler and his wife, Cicely (Hyland) Butler. They had lived at 302 Berkeley during the 1925-1926 season. He was an importer of textile machinery. They had moved to 311 Marlborough by the 1928-1929 season. On August 21, 1928, 251 Beacon was acquired from Jennie Guild by real estate dealer Henry S. Rogerson. On May 22, 1929, it was acquired from him by real estate dealer Henry C. Brookings, and on the same day it was conveyed by him to Robert Jordan. Robert Jordan and his wife, Jane Laurel (Malcolm) Jordan, lived at 133 Commonwealth. He was a director of his family’s dry goods and department store, Jordan, Marsh & Co. He died in November of 1932. 251 Beacon was not listed in the 1929-1936 Blue Books, and was shown as vacant in the 1930-1936 City Directories. On April 14, 1936, 251 Beacon was purchased from Robert Jordan’s estate by Margaret Cochrane (Dewar) Porter, the widow of Dr. Charles Allen Porter. Their three children – Margaret Dewar Porter, Isabel DeCourcy Porter, and Charles Burnham Porter – lived with her. They had lived at 116 Beacon during the previous season. Margaret Porter continued to live at 251 Beacon until 1945, when she moved to Beverly Farms. On October 1, 1945, 251 Beacon was acquired from Margaret Porter by Julius A. Wentzel and his wife, Hazel Olive (Townsend) Wentzel. They previously had lived in Waban. He was an architect and construction manager for Woolworth’s. On May 20, 1946, 251 Beacon was purchased from the Wentzels by Dorothy Bruce (Fetherolf) Muller, the wife of Robert Arthur Muller. They previously had lived in Wellesley Hills. He was vice president of the Atlas Plywood Corporation. On September 2, 1948, 251 Beacon was acquired from Dorothy Muller by Francis Lyster Jandron. He and his wife, Ada Woldin (Reynolds) Jandron, made it their home. They previously had lived in an apartment at 180 Commonwealth. Francis Jandron was a director of the Christian Science Church. Ada Reynolds Jandron was a Christian Science practitioner and served as president of the church. On June 29, 1953, he transferred the property into his wife’s name. They continued to live at 251 Beacon until 1961, when they moved to 1 Emerson. On April 27, 1962, 251 Beacon was acquired from Ada Jandron by Shirley Clifford Speed, a real estate dealer who converted many Back Bay houses into lodging houses and apartments. 251 Beacon was shown as vacant in the 1962 City Directory. On July 9, 1962, 251 Beacon was acquired from S. Clifford Speed by Octavia Morley (Sawyer) Walsh, widow of Edward M. Walsh. She previously had lived at 191 Beacon. She owned the Walsh Sprinkler Company, dealers in automatic sprinkler systems. She continued to live at 251 Beacon in 1964, but had moved to 52 Bay State Road by 1965 and to 218 Commonwealth by 1966. On August 20, 1964, 251 Beacon was purchased from Octavia Walsh by Rev. Joe Brown Love and his wife, Ruth Preston (Winfield) Love. Joe Brown Love was chaplain at Boston University; Ruth Love was a speech therapist. In March of 1965, they filed for (and subsequently received) permission to legalize the occupancy as a two-family dwelling and lodging house, which they indicated was the existing condition. In June of 1970, they filed for (and subsequently received) permission to convert the house from a two-family dwelling and lodging house into to a three-family dwelling and lodging house. In the application, Rev. Love explained that he had just retired and the additional unit was for occupancy by himself and his wife, the second unit was for occupancy by his son and family, and the third was a studio apartment. On October 28, 1978, 251 Beacon was purchased from the Loves by the 251 Beacon Realty Corporation. In December of 1978, it filed for (and subsequently received) permission to convert the property into six apartments. 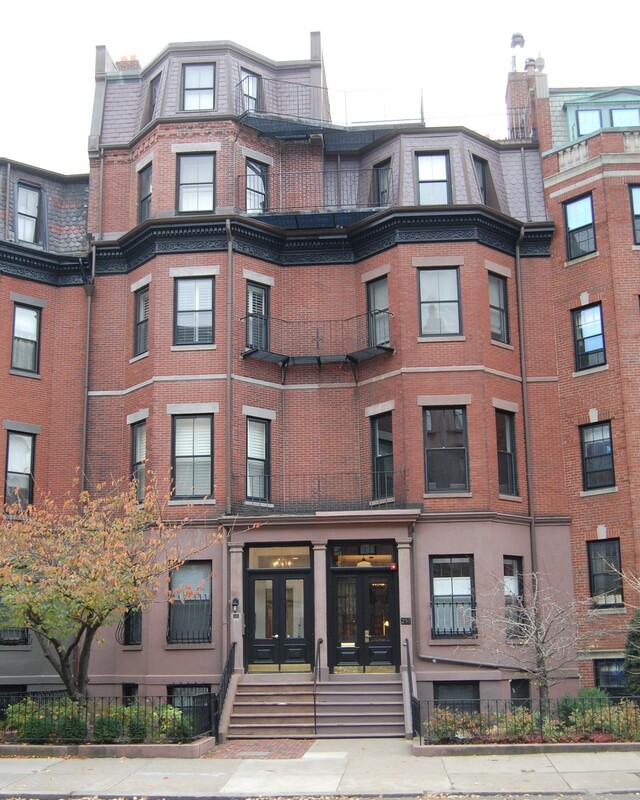 On February 20, 1979, it converted the apartments into six condominium units, the 251 Beacon Street Condominium. In November of 1989, the condominium association filed for (and subsequently received) permission to reduce the number of units from six to four, reflecting remodeling and consolidation of the previous units. On April 29, 1991, the condominium unit owners amended the master deed to reflect the reduced number of units.